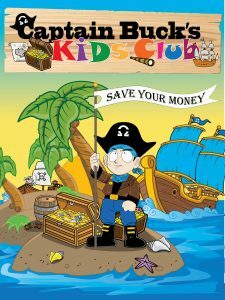 Your little kiddos can learn the importance of saving their money with the help of OMEGA’s own “piradical” pirate Captain Buck! 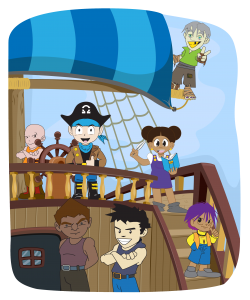 Captain Buck’s Kids Club gives your Swashbuckling Savers access to a free account and access to Captain Buck’s Treasure Chest of educational games and activities that help children learn the value of saving. With just $5 to establish membership, your child can have their very own piece of OMEGA FCU, while learning to manage their money. Your child will feel SPECIAL with their very own savings account and with every $5 (or more) in person deposit gets them a punch on their Kids Club Card. After 10 they get a $10 deposit into their account. If you would like to open a Youth Savings Account, Click Here for an application to print out and drop off, mail, fax to 412-369-3828, or email to ofcumembers@omegafcu.com. *This account must have a parent or legal guardian as joint owner. Children and joint owners are both authorized users on the account. This account receives a quarterly statement. Deposits can be made at any time with no monthly limits and can be made through the mail, in person, or through payroll deduction. At age 12, all youth accounts are transferred to our Teen Advantage Savings Account. Our Youth Members love our A’s Pays Program! Bring in a copy of the report card or Fax it to: 412-369-3828, or email it to ofcumembers@omegafcu.com. *If your child’s school does not use the “A’s” grading system we gladly accept any report card showing us that your child is doing their best. Every April OMEGA celebrates our youngest members with our Annual Youth Month. For the entire month we provide snacks, prizes and host fun contests that your children will love. Feel free to bring them into any of our locations to celebrate and be sure to teach them the importance of saving their money. Be sure follow us on our Social Sites for dates and promotions.